Much like last week, there really is a limited amount of material for me to talk about here. It's a pretty simple episode, but sort of brilliant in its simplicity. 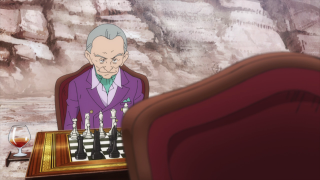 Lupin is playing a chess game with this Zylberstein character while Mirage targets Lupin and Jigen targets Mirage. Straight forward, not a whole lot of other set up details, not a lot of plot points, just some good old fashioned gunslinger vs gunslinger action. Daisuke Jigen's past always seems to be a rich tapestry of old rivals and women he totally wasn't interested in, anyway, so cares if they died or are trying to kill him? 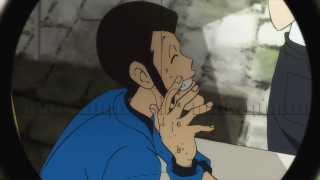 In plenty of Lupin stories in the franchise, he was part of some guerilla effort or mafia and the like, but likes to keep his history close to the vest right until it nips at his heels. Goemon is a bit like that, too, but he's just as likely to be forward about what happened just to assert that it's his problem alone. Lupin and Fujiko are a little more whimsical about their own pasts, though in the latter's case, it's hard to tell whether or not she's telling the truth, and she certainly never tells the whole truth. While Lupin also has a parade of old partners coming back to screw him over somehow, it's endemic for Jigen, who also seems to have a troubled relationship with women that unlike Lupin, he doesn't chalk up to the lifestyle. In this case, it's not exactly clear what Jigen and Mirage were comrades in, though it seems like some kind of paramilitary group, maybe a foreign legion-style force, and both were expert shooters. One day Mirage turns up pregnant and decides to call it quits to raise her child. I don't believe there's any implication that the kid is Jigen's, but the two obviously had some kind of affection for each other that Jigen is reticent to exhibit to anyone else, including his own bad of close colleagues in the thieving business. When it turns out that it's actually the original Mirage's daughter that the old rich man hired, he goes out of his way to try to convince her not to take up her mother's occupation out of desperation. It's a rare peek at Jigen's seldom-seen warmth, or at least his version of it. 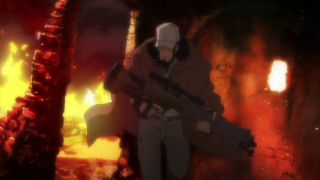 It also occurs to me that perhaps Jigen sees his line of work as a burden. Or, at least, he recognizes it as a burden for others who take it on. Maybe he sees himself as too far gone in his role to do anything else. More likely, though, he was just respecting Mirage's decision to get out of the life and extending that notion to her daughter. 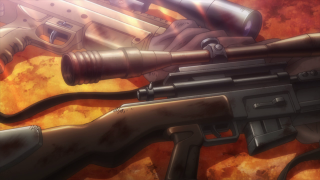 But hey, we all know why we watched this episode: sniper vs sniper! 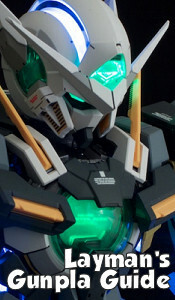 I haven't seen such a compelling match like this since Ghost in the Shell: Stand Alone Complex 2nd Gig (I guess the one in Solid State Society was good, but short). 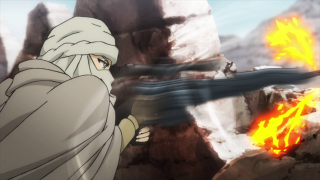 Jigen avoiding the HEIAP rounds, figuring out there was a drone, and running from one cover to another to stay ahead of the game, Mirage II's feints and her plan to bury Jigen in rock, that moment when Jigen's bullet flies out of the dust, causing Mirage's shot to hit Zylberstein, this is the kind of suspense and action I've been wanting for a while in this. 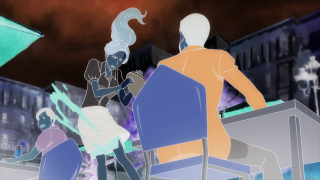 An especially memorable moment is Mirage just getting fed up and trying to club Lupin to death with her rifle, and Lupin's quick flip of her, revealing who she is. You can feel the utter hopeless frustration after Jigen's constant sabotaging of her efforts. This was an incredibly fun one-off episode with a simple premise and excellent follow-through. Apparently, next week is a Zenigata-themed episode! It's about time we get one in this series!